We are a leading Manufacturer of trinocular gemological microscope, gemological microscopes, binocular gemological microscope and dark field gemological microscope from Ambala, India. We are involved in providing an exclusive range of Trinocular Gemological Microscope. Offered range of microscopes are assembled using optimum quality basic inputs by the highly experienced workforce with the help of modern machines. These products are widely appreciated owing to its reliability and long lasting life. 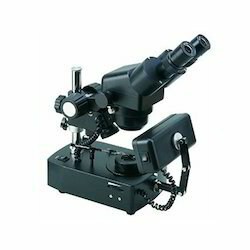 These microscopes find application in a number of industrial sectors and are in high demand. These products are available at very reasonable prices with us. Leveraging on modern production facility, we hold expertise in providing Gemological Microscopes to our valued patrons. Highly skilled professionals communicate with the patrons to understand their demands and design the products as per the detailed requirements. Moreover, our offered product is highly reliable in nature and is carried out in complete compliance with the industry defined standards. 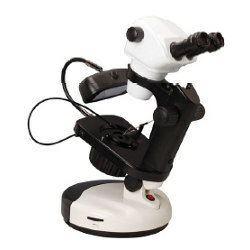 Banking on our vast industry experience, we offer Binocular Gemological Microscope in the market. 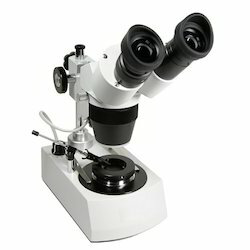 The uniqueness of these microscopes comes from its compact designed body and the updated version of the digital technology. Basically, these products find application in various fields. Highly demanded, these are manufactured at state of the art center. These are designed and developed by employing finest quality components. Besides, these can be availed in pocket friendly prices. Our esteemed clients can purchase from us a quality-approved assortment of Dark Field Gemological Microscope at pocket friendly price. With the constant support of a team of experienced employees we manufacture the offered products with high quality features. These products can also be provided in customized options also to suit the needs and demands of our valuable customers. Apart from this, we are offering these products at very reasonable prices.